I've forgotten where this info came from. Sorry! Edited by yours truly (contact me). 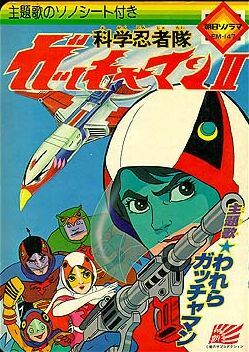 The image came from Gatchaman II. Saban Entertainment, the company that brought us "Mighty Morphin Power Rangers" and "Dragon Ball Z," purchased the rights to Gatchaman II and Gatchaman Fighter for re-release. Saban has combined the 100 sequel episodes (52 of Gatchaman II and 48 of Gatchaman Fighter) to create 65 dubbed episodes, with the most emphasis on the weapons and vehicles from Gatchaman II. On the week of September 9th, 1996, Saban's Eagle Riders premiered on US televison, and ran until Fall of 1997. This marks the end of the series run in the United States, but Saban still plans to continue the series in Europe and Australia. First, the soundtrack was completely replaced. The new background music is intrusive and doesn't compare to Hoyt Curtin's work in BotP, but it is an improvement over the original G-II background music. Second, a few of the explicitly violent scenes were cut, but not enough to make any difference. Most of the clipped scenes involved destruction shots that included innocent bystanders. Saban also cut out any scenes with personal violence. No one with a name was allowed to die in Eagle Riders, while G-II and Fighter were notoriously deadly to guest characters. Third, the Vorak goons are "androids." The original Gallactors (with only one or two exceptions) are not. Apparently we still have to protect kidvid from the serious aspects of war. Fourth, one good thing going for this series was its allusions to events that happened before the Eagle Riders storyline took place. It was hinted that the Eagle Riders had been battling the Vorak before the currently storyline started, and that something horrible had happened to Joe at the end of the first battle. 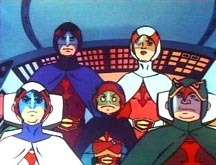 Berg Katse, chief villain in Gatchaman, was referred to in Eagle Riders as "Lukan." Fifth, at the beginning of Gatchaman II, Sosai X (Cybercon) returns to Earth, smashes through a cruise ship and kidnaps a six year old girl which he mutates into the villainess, Gelsadora (Mallanox). This was cut out of the beginning of Eagle Riders, then brought back later in the series (not shown in the US). Sixth, why does Mallanox look female yet have a male voice? Oddly enough, in Gatchaman II, a male actor did Gelsadora's voice, and the effect was just as weird. The new voice, by R. Martin Klein, is a close match to the original, but for some reason, Mallanox is said to be male. The character then switches to female later on (complete with female voice) for reasons not quite explained by Saban (again, not shown in the US). The comedic treatment of Mallanox (think Rita Repulsa) seems to fit better in Eagle Riders than Gatchaman II. Finally, Saban cut out some of the episodes and set up a new order for the others. Only thirteen of these episodes ran in the United States, while the remaining 52 episodes were run in Europe and Australia. If there is any hope for a further US release, it will be on cable. Unfortunately, it appears this is as good as it gets. I had the opportunity to preview some of the later episodes in July, 1997. They were a major disappointment. The above description came from Gatchaman - Home of the White Shadow, and was edited by yours truly (contact me).